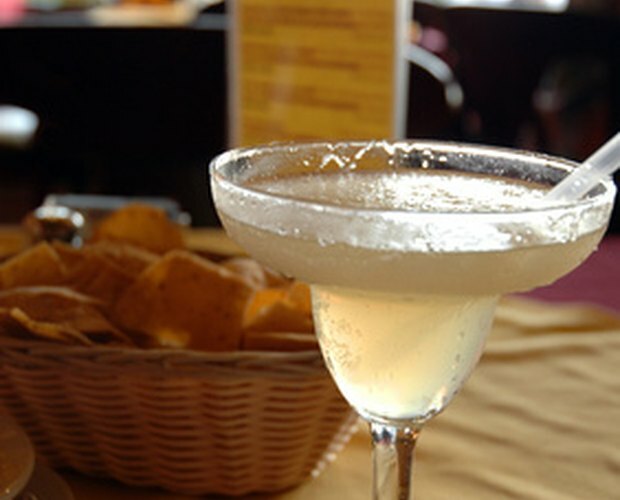 There are many versions of the margarita cocktail, but a basic margarita is made of tequila, orange liqueur and lemon or lime juice. A top-shelf margarita uses premium tequila and orange liqueur. Flavored liqueurs can be added in addition to the orange liqueur to create various flavored margarita drinks. Tequila is the main ingredient in the margarita, making up about 50 to 60 percent of the drink. Tequila can range from $10 to hundreds of dollars for a bottle depending on the brand. The price does not always determine the quality of the liquor, and the best tequila to use in a margarita can vary based on personal preference. Generally speaking, the best quality tequila should read 100 percent agave. Because tequila makes up so much of the drink, choosing a good tequila is important; otherwise your margarita may have a harsh taste. Orange liqueur is made from orange skin and has a dry citrus flavor. Triple sec is the orange liqueur used most often in margaritas, but there are other types of orange liqueurs you can use. Cointreau is one type of orange liqueur that bartenders use often when making margaritas. Grand Marnier is a cognac-based orange liqueur that is often used in top shelf margaritas; however, adding grand Marnier transforms your drink from a true margarita to a cross between a margarita and a sidecar cocktail. 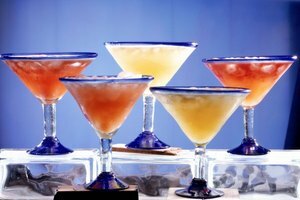 You can add other liqueurs to a margarita to change the flavor of the cocktail, as long as the main ingredients are there. Add pomegranate liqueur to make a pomegranate margarita. Add Godiva liquor to create a chocolate margarita. You can create a peach margarita by adding peach schnapps.